Android. Get API key from Google APIs Console. It is nessesary to activate Google Cloud Messaging for Android before key generation. Detailed information on how to receive an API key you can find in native Android devtodev SDK documentation. iOS. Generate Developer or Production Certificate for the application and get Private key file (.p12) on its basis. Detailed information on how to receive a Private key file you can find in native iOS devtodev SDK documentation. 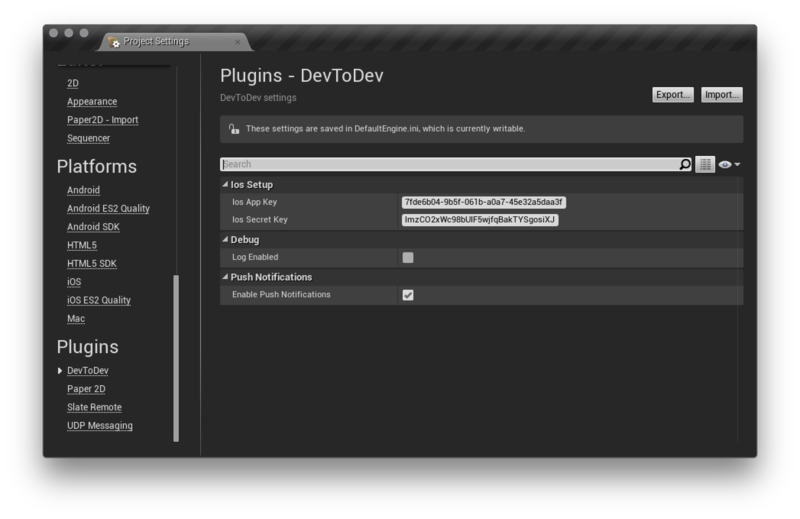 Submit the data to the application settings in devtodev system. Integrate devtodev SDK to the application (see the "SDK integration" division to learn more about integrating and initializing devtodev SDK). Сhoose the "Enable Push Notifications" option in project settings. Create a campaign for sending push-notifications in "Push" section.